Click the Inbox icon in the Mail module’s Folder pane (or press Ctrl+Shift+I). Click the Home tab and find the Quick Step box’s scroll bar (on the right side of the Quick Step box; it has one up and two down arrows). Click the arrow on the bottom (the arrow with a line above it). A list drops down with two options at the bottom: New Quick Step and Manage Quick Steps. Point at New Quick Step. Additional Quick Step templates from which to choose. Custom: This opens the Edit Quick Step dialog box so you can create your own custom Quick Step. Select a Quick Step template. As you saw with the Move To Quick Step, a First Time Setup dialog box opens. Make your choices and name your template. 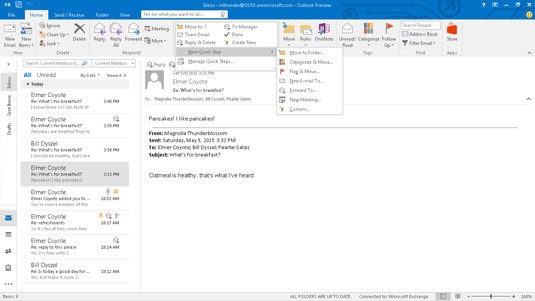 Depending on the task, you’ll need to tell Outlook where to move a message, how to categorize a message, what flag to set, to whom to send or forward a message, or to whom to send a meeting invitation. After you input this information into the First Time Setup dialog box, be sure to also give this Quick Step a name that will help you remember what it does.